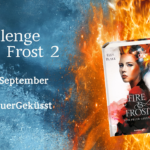 Today Elly Blake stopped by the Bücherstübchen as part of the Fire & Frost Challenge #VomFeuerGeküsst. It was hard to resist to ask her a million questions and I was very happy to get the chance to ask a few questions. Hope you enjoy the interview. What means reading to you or why is reading better that e.g. movies? Oh, I think reading is so much more powerful than any visual media, though in a different way. We really connect with books on a deep, visceral level because we get so much more of the characters’ thoughts and emotions. As we read, all the visuals are derived from our imaginations and perfectly tailored to what we want to see, and what we most connect with. I love how movies show us worlds and characters (for example, Lord of the Rings was a visual feast) but my connection is always stronger with a book. Do you have a favorite (bookish) quote? One of my favourite quotes is from Persuasion by Jane Austen: “I can listen no longer in silence. I must speak to you by such means as are within my reach. You pierce my soul. I am half agony, half hope. Tell me not that I am too late, that such precious feelings are gone for ever. I offer myself to you again with a heart even more your own than when you almost broke it, eight years and a half ago… I have loved none but you.” I think it’s one of the most romantic quotes in literature! A relationship between authors is something very special – what would you say is your most precious memory so far? 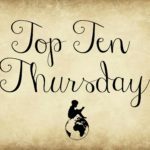 I’ve had some really special experiences, such as meeting authors I’ve admired for a long time like Jane Yolen, Tamora Pierce, and Laini Taylor. I’ve also really enjoyed meeting other debut authors who I absolutely loved, such as Stephanie Garber, Nic Stone, Tiffany Jackson, Chelsea Sedoti, Traci Chee, Julie C. Dao, Rosalyn Eves, and Tomi Adeyemi to name only a few. My truly favourite memories are from times spent with my closest writing friends at conferences or on writing retreats. Most of my closest friends are people I met through Romance Writers of America, or from a writing contest called Pitch Wars. There’s nothing better than chatting and brainstorming in person, as well as writing side by side with your friends! As a librarian you probably read many books as well – is there one Book where you would like to change the ending and why? I loved the Hunger Games series by Suzanne Collins, but I found it a bit tough to read Mockingjay. I wouldn’t exactly change the ending, but I felt so bad for Peeta and what he went through! I struggled with that book because I wished he didn’t have to suffer so much, not to mention what happened to Katniss’s sister! I just found that really sad. Did you recognize a difference between German and US/Canadian readers? I’ve noticed that German readers are willing to share their love of a book with full and complete enthusiasm. I was so impressed by the creativity of book bloggers who created mood boards for Fire and Frost. They went all out, wearing masks, painting their faces, creating graphics with the illusion of fire or frost around them, drawing original art, and more. When they are passionate about something, they don’t hold back, which is a quality I adore. I’m so excited when I see a new Instagram post by a reader, and German readers have been so very good to me! If you could choose three bookish people (fictional and non-fictional) to invite for a dinner party, who would they be and why? If you have the chance to swap your life with a book character – who would it be? I’m currently reading Cruel Prince by Holly Black, and I absolutely love Faerie, the world where Jude lives—filled with imps, pixies, boggans, hobs, foxkins, and all kinds of magical creatures. I would love to experience that world, although it would probably be more dangerous than I could truly handle. I also love that Jude wants to become a knight to secure her place in Faerie. I have to keep reading to find out whether she succeeds! If your life would be a book title – what would it be? Haha, that’s a tough one. Probably something like The Girl Who Felt Too Much. I get emotional pretty easily. What is your favourite moment to write? Maybe with something special to drink or eat? I love writing outside in my back yard when the weather is nice. If not, then I write in my office in the basement (formerly a guest room.) When I’m trying to get in the mood to write, I listen to orchestral music (mostly soundtracks like Game of Thrones or Pirates of the Caribbean). I drink coffee in the mornings and sometimes I like to drink peppermint tea in the afternoons. I actually started drinking peppermint tea when I visited my cousins in Germany was I was 17! It’s still my favourite tea, though I also like chamomile, English Breakfast, and Earl Grey. Can you share with us something about the book that isn’t in the blurb? There are quite a few twists and turns in the plot. Ruby goes to Sudesia to find out more about the Minax, but she also discovers secrets from her past. I don’t want to spoil anything, but I hope readers enjoy learning more about Ruby’s heritage in Sudesia! Are there people around you who inspired some of the characters in frostblood? The only character I can think of who reminds me of someone in my real life is Brother Gamut, the healer monk who lives in Forwind Abbey. He reminds me a bit of my Oma (my father’s mother), who was an absolutely gentle soul. She had a soft, loving presence about her that I think inspired Brother Gamut’s character. Do you have a favorite chapter in book 2 and what is it roughly about? I have a soft spot for the scene in the ice garden with Arcus and Ruby. That’s when he shows her how he feels in a tangible way by creating things of delicate beauty out of ice. It’s one of the things he does to express his feelings without words because he always feels more than he can say. Then again, any scene with Ruby and Arcus tends to be close to my heart. You are a tour quide in the frostblood series – which important place would be the first on your list to show? I would choose Forwind Abbey because that’s where everything really begins. Is there a or two song which represent your book series? I can’t seem to listen to songs with lyrics when I’m writing, so my two choices are both orchestral: I loved writing to the track “The Fire Rises” from the Dark Knight Rises soundtrack by Hans Zimmer. I also adore the music from the last Agni Kai from Avatar: the Last Airbender, the animated series. That battle between Zuko and Azula still gives me chills! What would be a key message of your books? I think one of the major themes in the books is about choice being more powerful than destiny. Light can triumph over darkness, but you have to choose it, and it’s not always easy. The gifts or challenges you are born with don’t define you as much as your choices do.